Isn't that the cutest teapot...it was a gift from a good friend a couple of years back. She knew I would love it because it has all the things I love....dots, stripes, and red. How perfect is that. And I sure don't have to look far for a matching red cup. Last week I told you about the helicopter's flying overhead, policemen combing the neighborhood after shots were fired but never finished the story. This is what I know....and it all sounds a little fishy to me. A man (bachelor) that lives in the front part of our sub-division (I live near the back-end) was asleep when his dog hopped on the bed and pawed at his face, waking him up. He got up, went to the bathroom, then when coming out of the bathroom he heard noises downstairs. He grabbed his gun (???) and went downstairs, sees the intruder and then fires 6 shots. The intruder ran out through the door and that was the last we saw of him. There was no blood, so it does not appear that the bachelor hit his target after 6 shots. There has been no further word on the intruder nor the neighbor with the gun, altho he did give several radio interviews that same day stating he was well within his rights to fire a gun when there was a threat to him in his own home. The helicopters circled for at least 4 hours, what they were trying to see, I'm not sure. I never saw any report in the newspapers and I don't even think it made the 10:00 o'clock news. In the wake of what happened last Friday, I am a little nervous knowing there is a man living in our neighborhood with a gun that begins shooting without a true threat to his life. We live in scary times. Last night I went out to dinner with friends and then to church for a beautiful Carols & Candlelight program. So beautiful, so full of wonderful sounds of violins, bells, Christmas carols, voices singing. Fills me with fresh faith after the tragedy. On the way home I stopped and snapped a couple of shots of houses all lit up. 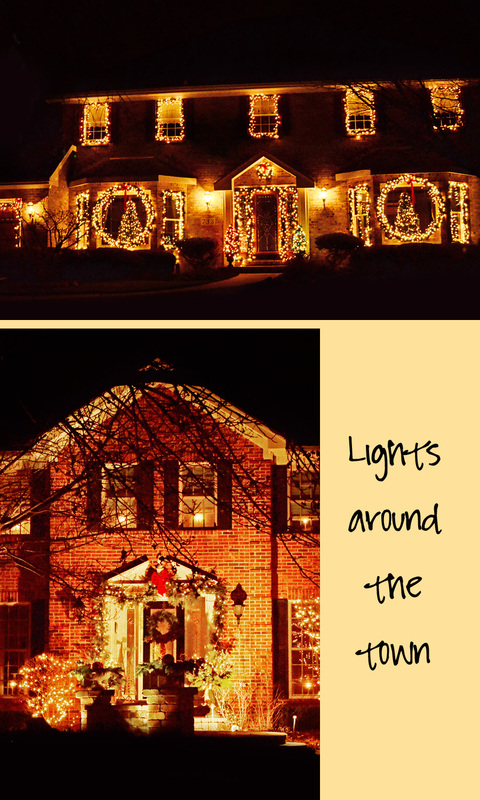 I really like the one with the two identical windows with a wreath of lights and Christmas trees. I need to study up on night photography, and I know the best time is during that magic time, but the magic time was long gone by the time I managed to take these shots. I have been busy with Christmas cards all day. Must get them in the mail, running out of time (once again). Well, back to work. Hope your Monday has been pleasant. Deanna! nice photos! you know what you are doing. i could see those homes just fine/great. Q: on the dude with the gun: why didn't those dogs go after the so-called intruder? hmmmm. everyone has a gun now days. it's the crazies we need to worry about. oops... forgot to say that that tea-pot is adorable. you have nice friends. That is a crazy story! Yikes, stripes!! Those houses are stunning though! I miss that now living in a more city area - fewer lights out! So thanks for sharing your neck of the woods! Oh! I love that teapot! And I'm with you on the gun thing. 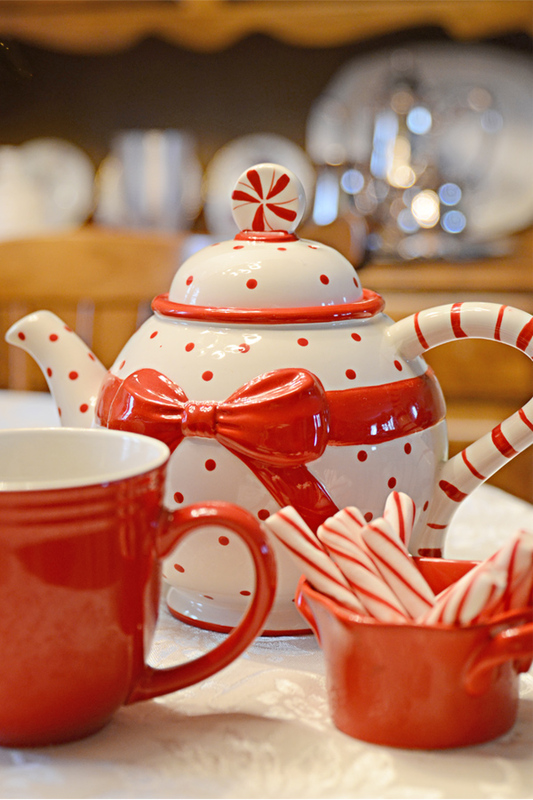 Your teapot is so darn cute. I love the candy cane inside the cup. and such pretty house lights. That sure does sound like a scary story. It is scary times we live in. Now that's a scary scenario! quite weird... but I enjoyed your nighttime photos - I must try to get out and get some myself.